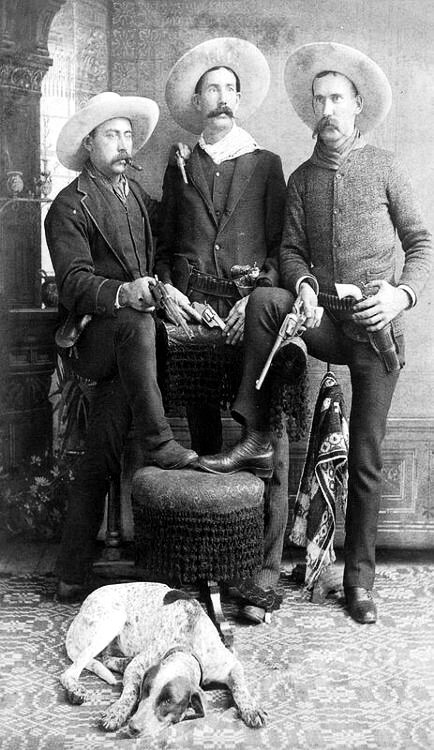 Interesting photo of city dudes playing cowboy (check out the tight pants and town shoes). Quite an interesting array of hardware they have, but not one of them looks like he has a clue how to use it (the gent on the right has the piece he’s holding cocked). Looks like the only one not faking it here is the dog. This entry was posted in Uncategorized on September 26, 2014 by J.R. Sanders. Does it get any cooler? What a great picture. These boys have more shooters then a car load of East LA gang bangers. I love the guy on the right. He has his shooter cocked and the poor dog doesn’t have a clue he could be about to take the long nap. Cool pic, thanks pard.